IndoorMedia Group was established in 2008 with a single mission - to create the world's best musical arrangement. Industry Leader 2012 by the National Business Rating. Legal music business. Copyright and related rights in the audio-visual works. Complex solutions in the field of audio marketing. Products Group IndoorMedia it: music, video and rights to use them; management software broadcasting; management services to broadcasting; recommendations and selection of musical repertoire; music, legal, technical support. Consultants IndoorMedia direct all their efforts to create the best integrated solutions in the field of musical design institutions HoReCa market and Retail. 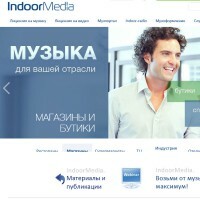 Focus on a common goal helps IndoorMedia provide the best products in its field.